SHORT-ORDER COOK IS "SALE PENDING". PLEASE CHECK BACK LATER. 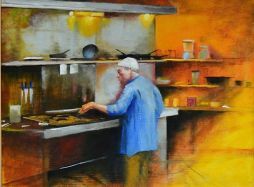 Original Figurative Art Oil Painting for sale by American Fine Artist Robert W. Moore depicting an Asian-looking man dressed in traditional Asian garb working at a large stove cooking.